"Is Christmas Really 'Just Around the Corner'?" I just got home from judging all day-- and I mean all day-- at a hunter and equitation show near Los Angeles. Because this showground is only a few miles from the ocean, it's prone to cool temps and morning fog. To illustrate, here's a photo I snapped on my way to the judge's booth. The first equitation over fences classes for the little kids was about to start. No, there's nothing wrong with my camera. It's just foggy! I love the look of concentration on the faces of these little kids while they study the course. On the other hand, notice the expressions of their horses and ponies. They seem to be saying, "Big deal. A couple of wooden boxes stuffed with fake flowers and some phony brick walls. Whatever. When's lunch? I hear they're serving carrots." And indeed, they were serving carrots to the winners of the 3 medal classes. In fact, this show hosted the medal finals for all the winners who'd qualified earlier in the year. Since I've competed in many medal finals in my show career, I really enjoy officiating over them. Not everyone gets to experience both the challenges of riding in a medal finals and judging them, too! Because of my recent car accident (see my last blog posting), I had to be shuttled to the show by my mom. And then Ron came and picked me up. It was a long day, so I'm glad I didn't have to drive all the way home after dark. It's probably good that I don't have any judging assignments until after the start of the new year, because I'll have time to get completely healed from my surgery and re-charge my energy. Yet even though I'm tired, I had a great time. I shared the judge's booth with Nancy Frost, a well-known USEF judge who also trains at L.A. Equestrian Center. The arena Nancy judged held the jumper division, the "advanced" medal finals and the classes for the older junior riders. I had the walk/trot division, the "intermediate" medal finals and the novice rider classes. During any free moments, we chatted about horses (duh! ), changes in the show world we've witnessed over the years, and which horse or pony we'd seen that day that we'd like to take home. There were quite a few of those. But then, Wally might get jealous. And I couldn't have that! You can contribute your comments by either emailing me at: hc-editor@bowtieinc.com or clicking on "comments" below. I read them all! Thank goodness Wally makes a good bicycle, because I'm going to be riding him around town for a while. You see, Ron and I are currently short one vehicle, and I can't be stranded without a car when I have to get over to Sue's to give a riding lesson. Why this set of circumstances? Well... On the way home from my doctor's office on Wednesday I rear-ended a truck on the freeway. I wasn't on my cell phone. I wasn't eating or drinking anything. I wasn't trying to switch CDs and steer at the same time. I think I was just distracted. And overwhelmed. And exhausted. It had been a rather tortuous time at the doctor's office. First I had to sit with the representative from the company that manufactured the implant I have. She fiddled with her computer, getting it to "talk" with the computer I have in me to adjust the settings. Then I got the joy of having the stitches and staples removed. While it was a relief to be rid of them, I began to feel like a horse having its mane pulled. Every so often I couldn't help but say, "Yikes!" On the way home, the adrenaline that had been coursing through my body began to subside. I was cruising down the freeway, looking forward to getting home so that I could groom Wally and put him to bed. But as I neared my exit, I realized that the big truck in front of me had stopped. I slammed on my brakes-- I was driving my husband's near-new Toyota SUV-- but I knew instantly that I was not going to be able to stop in time. Fortunately, the man in the truck was not injured. In fact, his truck didn't appear to be damaged much at all. But the Toyota's hood was crumpled like an accordion. In the horse world, I'd compare it to riding a dainty, narrow-barreled Thoroughbred in a crowded warm-up ring and then, while cantering, body slamming into a warmblood. A warmblood that was standing still. After we exchanged insurance information, the man drove away in his truck. Meanwhile, my husband's SUV limped to the side of the freeway until it could be coaxed onto a tow truck. It's being stabled at the body shop in town until it's remodeled. And trust me, that will take a while. So, like I said, it's a good thing that Wally doesn't mind being a bicycle. Yesterday I rode him over to Sue's and sat on him while I gave a private lesson to one of my students. And tomorrow I'll probably do the same thing. I've also been riding him to the stack of mailboxes that serve my neighborhood. I hop off, unlock my mailbox, stick all of the correspondence in my saddle bag, climb back on and ride home. It's all much like a modern day Pony Express if you think about it. Honestly, if I could figure out how to carry home a bag of groceries on Wally, I'd do that, too. There really are hitching posts outside several of the little markets near me. But I'm afraid that milk would be churned into butter by the time Wally carried me back to my house. So getting the car fixed and back in the barn-- I mean garage-- will be very, very nice. Wally agrees. If you'd like to commiserate or share your own tale, just click on "comments" below. I always enjoy reading them! Spending a life with horses means that I also spend a lifetime meeting interesting people who leave indelible impressions on me. They are, in a word, unforgettable. Such a person was Varley. It's an intriguing name for a woman, I'll grant you. But then, Varley was an intriguing person. 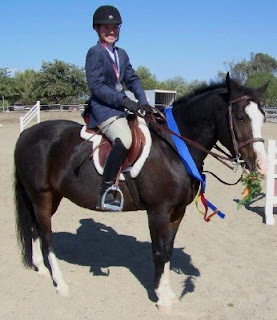 I crossed paths with her about 8 years ago, the first time I judged a hunter show at what was then called Galway Downs, an equestrian center trying to survive in the wine-growing region of Temecula, California, just north of San Diego. Though houses were springing up like sunflowers all around the cross-country course and oval training track, Galway Downs resisted the urbanization and defiantly held its slate of horse shows. It seems fitting that a spitfire like Varley was the leader of the show management group. She also commandeered her state-of-the-art, stainless steel catering truck, a sort of mobile gourmet kitchen that was the size of a small battleship. Varley didn't cook up just any old burrito or chili dog. She offered pita sandwiches, chicken salads and BBQ'd tri-tip. Over several stints as horse show judge I began to appreciate her free-spirited involvement in the horse world. She wasn't much of a competitor herself, but she loved horses. Her dream was to raise a small herd of pinto sport horses that would be successful in her favorite discipline: three-day eventing. She had a band of nice Thoroughbred broodmares and bred them to a couple of colored Dutch warmbloods. The result? In a few years Varley had a field full of wildly spotted, leggy young athletes. I think I judged maybe a half dozen shows for Varley and her gang. But it was Varley who always had more nervous, busy-body energy than a ground squirrel. She was always laughing, sometimes raucously, and each show day, when she handed me my clipboard and walkie-talkie, she'd have some silly remark or quirky observation that would crack me up. Such commentary seemed appropriate, given her physical appearance. She was short but strong and cheery, with strawberry-blond hair, light eyes the color of an early morning, and a faint splash of freckles across her cheekbones. She looked much like a "mature" California cowgirl who just could not bring herself to admit that she had grown up. Good for her. And then, one day when the horse shows at Galway Downs had ceased their run, I got some bad news. Varley had climbed atop her stack of hay-- a task she did many times on her small horse ranch-- and slipped and fallen to the ground. She suffered several fractures of her spinal vertebrae and was paralyzed from the neck down. Permanently. Over the ensuing months, I heard reports on Varley's condition, and none of them seemed encouraging. She was rebellious, cantankerous, and downright uncooperative. Her closest friends struggled not only with what to do with Varley, but also what to do with her herd of splashy sport horses. Because I wasn't part of her inner circle of friends, I felt cast in the role of outsider. Who had I been but someone she'd interacted with, and then, only briefly? So I stayed away. And now, I feel guilty about that. Or at least conflicted. On the one hand, I could've offered her nothing but sympathy. I have no magic words, no special Supreme Powers to fix things forever broken. And yet, on the other hand, I admit that facing Varley would also mean facing the fear so many of us have: losing the ability to move amongst our beloved horses. Perhaps that's the main reason I never visited her. Despite access to the best rehabilitative treatments, Varley did not regain much, if any, use of her body. And all of her pretty horses were sold off, one by one. I'm not sure if any of them made it to the three-day event courses she'd dreamed of. A couple of weeks ago I was judging another horse show at another venue, and ended up chatting during the lunch break with someone who'd been a close friend of Varley's. She informed me that Varley had died the day after Christmas. I felt a sense of sadness for the rest of that day. Kids came and went through the gate and into the arena, posting the trot to their ponies and collecting satin ribbons from the ring steward. Adult amateurs, poised upon their trusty steeds, cruised around courses of jumps and then moseyed on out to their cheering coaches. I jotted down scores and relayed them to the announcer. But all that day I couldn't help but think of Varley. Defiant to the end, she fought against what Fate had dealt her. I guess she was much like one of those thick-skinned mares we've all known, whose heart and spirit just will not allow them to ever fully accept the saddles we cinch upon their backs. They will not, in their minds, ever be broken. I have such hope that somewhere, Varley is laughing again, perhaps galloping one of those bay and white warmbloods across an open field, down to a cross-country jump so that she feels the wind zing through that blond mane of hers. Perhaps, someday, I'll join her. If you'd like to share a thought or two, click on "comments" below. Today I drove to the feed store to order a few more bales of 50/50 mix hay. It's a great shipment of orchard grass and alfalfa that came in from a grower in the far northern tip of Nevada, and Wally relishes it. I happen to have a few extra bucks so I figured I might as well stock up on "the good stuff" before it's all gone. Just as I exchanged greetings with Tracy, the store manager, I was stopped in my tracks by a large display of holiday greeting cards. They were impossible to miss. A huge tower of cardboard shelves cradled cards featuring barnyard scenes, ponies in the snow, cowboys weathering a winter storm and Santa hitching horses to his sleigh. At first I was mesmerized. "Oh goody!" I literally said to Tracy, "now I don't have to order out of the catalog. You have a huge assortment right here!" And then, I realized, it's only mid-September. But I'll be honest. I've already been filing away ideas for holiday gifts for more than a month. I have some clues as to what to get for my sister, Jill. I even bought a few trinkets on sale that I can dispense as gifts at parties. So it's not like I haven't been incubating a holiday mindset. It's just that the mountain of greeting cards blocking my path-- at the feed store, no less-- kind of caught me by surprise. Yet now that we're on the topic (or at least I'm on the topic), I decided to begin my Christmas wish list. Thus far I've only come up with one thing: A clip-on watch, the style that can snap to a belt loop on my jeans or a dee-ring on my saddle with a heavy duty caribiner snap. It's the kind hikers use, although my lack of direction notwithstanding, I really can do without the compass that most of these watches include. You see, I absolutely detest wearing a wristwatch but occasionally, doggone it, I need to know what time it is. Imagine that! So a clip-on watch would work great for when I'm trail riding or giving riding lessons. Other than that, I'm still conjuring up ideas. If you're like me, you've probably already have at least one thing you're hoping for this holiday season. Click on this link: All I Want from Santa to go directly to the latest installment of HI Spy on Horse Channel. Then leave your comments there, letting your fellow readers (and maybe an elf or two?) know what you'd like to find all wrapped up with a bow. Cowboy studies the neighbor's horses that live on the other side of the fence. "Is there anyone over there who'd like to be my friend? Anyone?" For those of you who've never raised a foal before, I'll let you in on a little secret: The most stressful, nerve-wracking part-- after the actual foaling process-- is the act of weaning Baby away from Mommy. On large farms it's not that big of a deal. The colts are all sent packing into one pasture, the fillies are herded off to another pasture, and all of the erstwhile Mommies are left to sip tea and chat about their former children amongst each other beneath the trees in yet another pasture. But those of us who raise one or two foals at a time on small acreage don't get such luxuries. Instead it's more like, "Let's put Junior in this big paddock, which is three doors down from Mom." Fortunately, that tactic if handled properly, actually works just fine. 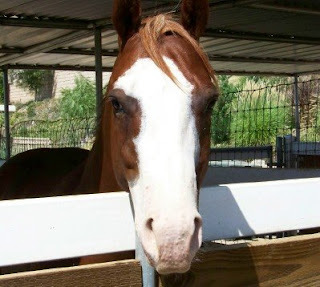 What helped with Cowboy is that his mother, April, thought that unloading her 4 1/2-month-old colt was just hunky dory. She was perfectly happy to help him pack his things and head out the door. Whether that's because she gets to be temporarily housed in a spacious, fully covered paddock or because she was an orphan foal that never realized she was an equine, I'm not sure. But any wailing and crying that ensued came from Cowboy, not from April. From the get-go April's impression of weaning was, "Peace at last!" Although Cowboy spent the first couple of days wandering the fenceline, hoping that a New Best Friend Forever would materialize, he eventually decided that he could survive on his own. He's settled down and is living independently, although he does appear to idolize Topper, my sister's ex-racehorse that has found a second career as a show hunter. I'm not sure if Topper is entertaining Cowboy with tales from the track or the show ring, but the two of them spend hours together. Sometimes their noses touch. Other times they yank fly masks from each other's face. Or they simply stand alongside each other, dozing in the sun, the fence being the only thing separating them. When Cowboy is taken out of his pen to be groomed and turned out, he's the perfect Good Little Boy. He even stands to get a shower. Ah kids, they grow up so soon! However, next weekend he gets his feet trimmed for the first time. I'll keep you posted on how that goes. Click on "comments" below to contribute your thoughts. I love to read them! I haven't posted on here for a few days because I suddenly got the news that I had been scheduled for my surgery. Just to review, it was to permanently add a new "lead" to my implant. That will provide electrical stimulation to the muscles of my upper back, thereby controlling pain and spasms. To mentally prepare myself for the whole ordeal, I began yesterday by riding Wally. I knew I wouldn't be riding him for a while after my surgery. Then it was off to the hospital, and that long, tortuous wait in the pre-op area where I resisted the urge to bolt and run from the bed while the nurses started the IV and got me into a gown that was cut like a homemade Halloween costume. It's interesting, the thoughts I had while I waited for my doctor to appear from the other side of the curtain surrounding my bed. I kept thinking about the most rewarding ribbon I ever won in a horse show: The championship for adult huntseat equitation that I won on Barbie at the year-end show in Del Mar, a few months before Barbie and I had our accident (the very accident that led to this very surgery). I kept reliving the way the stadium lights cast odd shadows across the arena in the nighttime performance. The class was huge, plus an entire course of jumps remained in the ring. We rode the last half of the class without our irons, but since I had practiced for hours without my stirrups, I was up to the challenge. At one point during the sitting trot, the judge asked the entire class to reverse. I still recall focusing on a spot diagonally across the arena and riding Barbie forward and on the bit to that exact place. I dodged jump standards, decorative floral arrangements and other riders. I was coming through! When we lined up, I had an inkling that I had won. I just had a sense of rising to the occasion and displaying my best horsemanship. When I was handed the tri-colored ribbon, I made a mental note to myself: "Always treasure this moment." And I do treasure it. That memory eased my anxiety as I waited to be wheeled into the operating room. The surgery itself went quite well. I have yet to turn on the stimulator, but that's because I'm really sore from the sutures and metal staples, so why bother? Besides, I know it worked properly because they tested it in the hospital before I was sent home. The worst part was the unexpected nausea that began just as Ron pulled the car into our driveway at about 8:00 last night. Not to be too graphic, but I was throwing up all night long. Even by morning all I could keep down was ice and a few sips of water. My doctor said it was a reaction to all the pain meds and the anesthesia, and prescribed some anti-nausea medicine. So now I'm at least well enough to sit here and type this. Wally, I'm sure, is wondering where I am. My goal is to shuffle outside and hand him some carrots. This temporary discomfort will pass, and then I'll back in the saddle, which beats sitting in the hospital any day. How many jumping rounds can a judge watch before she begins to go insane? There really isn't an answer to that. But believe me, I was beginning to ponder one while I was judging today. I first sat down in the judge's booth at 8:30 a.m. And except for a couple of potty breaks and a quick pass by the food booth, I judged non-stop until about 6:00 p.m. It wouldn't have been so bad except that mentally I was prepared to work a short day: a couple of my friends who've judged the same show had told me, "Oh, Cindy, that show is usually pretty small. You'll be finished by 3:00 at the very latest." At about 3:00 I was trying not to become hypnotized by what seemed like the 347th bay horse jumping the brown gate with the yellow flowers directly in front of me. On the bright side, it was a reflection-- I suppose-- of how fairly I was judging that riders kept adding classes all day. Well, that and the fact that this was one of the final shows on the San Diego County show circuit where riders could qualify for the year-end championships and the medal finals. To keep myself alert and focused I'd get up from my chair and stand on one foot while marking my scorecards. Or I'd do deep knee bends between jumping rounds. Then, when the flat classes came into the ring-- a welcome break-- I'd hop down the short flight of stairs and stand along the rail, just so I could be out in the fresh air. There was also a brief moment of near panic when the batteries in my walkie-talkie went dead. It was a little disconcerting when I was trying desperately to communicate with Linda, the backgate steward, and nothing was happening. She was oblivious to me. I was too far away to yell and smoke signals seemed out of the question. Fortunately, the show secretary had a box full of batteries and we were up and working again before too much calamity ensued. The brightest part of my day was chatting with two of the little pony girls after their classes were done for the day. 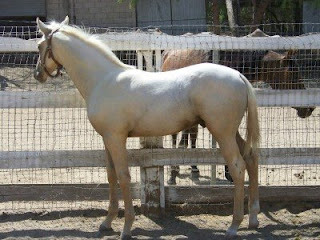 One rode a buff-colored palomino named Bippity-Boppity-Boo. Is that too cute or what? The other rode a very flashy pinto pony that flicked its little toes at the trot like a ballerina. Both of those little girls were excellent little riders and they were just as engaging out of the saddle. In between giggles one of them told me, "Our ponies are best friends and guess what? We're best friends, too!" Now, isn't that what horse shows are all about? Wally says, "Nothing bids a fond farewell to summertime like indulging in a casserole of pysllium, chopped fresh carrots, beet pulp and oat hay pellets that have been lightly tossed with a hint of vegetable oil. Simply scrumptious! And just to add to the enjoyment, you can lick the bucket afterwards." Since Ron and I moved to this house a year-and-a-half ago, we've attended more backyard barbecues, pool parties and holiday soirees than the 20+ years we spent in our former neighborhood. What makes these frequent gatherings all the more festive is that about 1/3 of the attendees own horses, too. Or at the very least, they like horses. Needless to say, that means that I'm never at a loss for conversation topics. That's a good thing because, believe it or not, I really do not enjoy crowds or parties. I get really nervous in groups of people, especially when we're chowing down on food that's balanced tenuously on floppy paper plates. It's all one big accident and stained horse blouse waiting to happen. Saturday is one more of these fetes. It's an End of Summer shebang. Because it's a standard potluck affair, I've been volunteered (by my husband) to bring "something." I decided on an appetizer because... well, because there were already 3 salads waiting in the wings, coming from other guests. I'm going with my Old Faithful recipe of stuffed mushrooms: whip some cream cheese together with chopped green onions, cheddar cheese and crumbled bacon, top with a dash of Lawry's seasoning salt and stick them in the oven until the mixture begins to bubble. They're gooey but good. And why not have some finger lickin' fun while you're upping your daily maximum intake of fat, sodium and cholesterol? Maybe, just for a joke one time, I ought to concoct one of these and bring them on a plate marked, "From Wally." You can always share your thoughts by clicking on "comments" below! Would you Like a Blue Ribbon to go with Your Dust? I had a lot of fun judging this past weekend. Because the level of riding and the quality of horses were quite high, I had the luxury of scoring rounds based on the finer points of a hunter's jumping style or an equitation rider's position rather than just pinning the ribbons depending on who got around the course without a major fault. Indeed, in the big horsemanship medal class, the difference between the first and second place winners was the fact that the second place girl held her hands a little too much like a puppy dog: her wrists were bent and her thumbs rotated in toward each other. That's it. 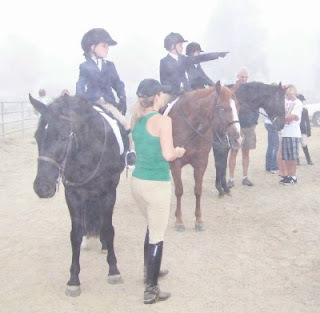 I was in awe of the baby green hunters, all of them ridden by professionals. They flowed around the courses, their long, low, even strides enveloping each jump effortlessly. Sometimes I had to remind myself, "Oh yeah, that's right. I'm supposed to be critiquing these performances and giving them a score." As you can see, I live vicariously through some of these riders. In one big equitation class on the flat, I decided to ask for additional testing of the top riders. They had to drop their irons and perform at the sitting trot and canter. Right away that revealed who could actually "ride" and keep their horses on the bit without their stirrups and who was merely a passenger on a well schooled horse. Yet just as I asked for them all to come down to the walk and line-up, my winning rider-- the one who had impressed me the most throughout the class-- must've bumped her horse's side with her heel accidentally, because the horse swapped onto the wrong lead. Immediately she caught the mistake and the horse swapped back to the correct lead, but it was too late. I couldn't ignore it, because it occurred right in front of the judge's booth. She knew what had happened. Perhaps the fact that I actually uttered, "Oh no!" made her realize that I had seen it, too. Instead of getting the blue ribbon, I dropped her down to fourth. But because she's an experienced competitor, I'm confident she understood my decision. And she probably respected me for it, too. The two days sped past quickly. It was as warm as I expected, but fortunately I was in the shade most of the time. Still, I ended up with a persistent glaze of sweat on my body from noon on. And while there was a grand production made of the watering and dragging of the arenas, I had enough dust on me each day to rival the coating of any piece of chicken about to be plopped into a frying pan. But would I do it again? Yes! Sign me up! The part I enjoy most about judging is empathizing, or in some cases sympathizing, with the riders. I have a sense of riding down to the jumps right along with them. I hope every kid picks up all the right leads, and I silently cheer for white-knuckled adult amateurs who cling to their horses' necks and somehow gather up the gumption to gallop down the first line of jumps. My biggest reward for judging isn't the paycheck, but seeing the way so many of the riders, both young and old, appreciate their ponies and horses. After the final class, I teasingly told one little girl-- she couldn't have been older than 8 or 9-- that I was going to sneak away with her pretty black pony, stuff him in the back of my car and take him home with me. "Oh no you aren't!" she said, laughing. And then she reached down and hugged him around his fat, glossy neck. I think the highest ribbon she'd won that weekend was a third place, but that was fine with her. She loved her pretty pony even more than me. That sent me away with a good feeling in my heart. Tomorrow and Sunday I am judging a hunter and equitation show. The fact that it is located at a rather posh training and country club facility promises that at the very least I'll get to be seated in a covered judge's booth, sheltered from the heat and sun. And it's a bit closer to the coast than my house, so it should be a few degrees cooler than here. Right now it's 93 degrees. And it's 5:30 p.m.
All of this means that I've already pressed a nice crease in my one and only "good" pair of semi-dressy Bermuda shorts because, don't ya' know, I am wearing them tomorrow! Plus I've frozen several bottles of water and cranberry juice (my favorite thirst quencher on a hot, dusty day) so I'm well prepared. 1. Do not stand outside the in-gate and flog and kick your horse in an effort to force it into the arena. From my vantage point I can see nearly everything, and even though the judging doesn't officially start until you enter the arena, my impression is somewhat colored if your horse is behaving as if he's being asked to enter the Gates of Hell. 2. By the way, I can also HEAR a lot of what's going on at the backgate. I'm really not bothered that much by enthusiastic coaching from the rail, especially if it's a class for beginners or white-knuckled amateur adults. But when I overhear someone call out, "Becky, you're on the wrong lead!" you can be sure that I am craning my neck, leaning out of the judge's booth to determine just who Becky is and, once confirming that she cannot tell which lead she's on, jotting down her number on the "Bad Bee" side of my score sheet. 3. Learn your course beforehand. Trust me, they're all posted at the same place at the backgate early in the morning. If it's 90 degrees and there's an open gate because you were too busy slurping a snow cone or chatting with your barn buddies to memorize your course, I am not going to be too happy with you when you finally saunter through the gate. 4. Don't get mad at your horse and physically punish him when you're the one who made the costly mistake. Ever. 5. Is it asking too much for you to wipe the sweat off your horse's neck and flanks before you come into the ring, especially for a flat class? That's why there are sponges and rub rags. It demonstrates to me that you are serious about presenting your horse for evaluation. 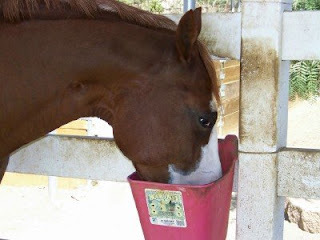 Besides, it makes your horse more comfortable, which shows me that you put your horse's welfare first. After all, I'd like someone to come wipe the sweat off my brow. And I'm the judge! Ron and I celebrated our 26th wedding anniversary this past weekend. Our relationship has withstood the challenges of a non-horsey man being married to a horse crazed woman. Naturally, this can cause some stress at times, although fortunately most of it Ron takes with a good sense of humor. Most recently was the Pookie Incident. I have a habit of calling people and animals by nicknames and I am apt to change these nicknames at a moment's notice. My dog Betsy has been christened with both Winkie and Scooter. Intermittently I call my sister, Jill, Sundance (as in Butch Cassidy and the Sundance Kid). Over the past few months I've been trying out the nickname "Pookie" on Ron. I have no idea where that name came from, but I like the sound of it, perhaps becuase it sounds like Cookie but even sillier. Or sweeter. Take your pick. I'm sure many of you are gagging at this revelation, that I call my very manly man husband Pookie. But I thought it was cute in a wifey sort of way. Ron, on the other hand, is not at all clever about nicknames. He persists in calling me Honey, which I find old fashioned but I cannot break him of this habit and it's been 26 years now, so what's the point? Honestly, when we were first married, I thought he was calling me Honey all the time because he'd forgotten my real first name. I guess Ron was accepting being labeled as Pookie because he was actually responding to it, although I was smart enough to refrain from calling out, "Hey, Pookie!" when we were in mixed company-- like around other manly men-- in places like Home Depot or the local truck wash. Maybe (who knows) he thought it was a special term of endearment I'd saved just for him. And then he overheard me the other morning when I walked out to see Wally. "Hey Pookie," I called, "do you want to go for a ride?" At about the same time Wally trotted up to the gate, nickering, Ron stepped out the back door and said, "I thought I was Pookie!" I was faced with the two men in my life, Wally and Ron, and both were owning the title of Pookie. "Well," I said quickly, "you're both Pookie. You're Pookie 1 and Wally's Pookie 2." Ron looked at me for a moment. "Uh-huh. How about I'm not Pookie. At all." Hmmmm... Maybe he never liked being Pookie in the first place. Wally, however, thinks the name is quite cute and is perfectly happy being the one and only Pookster. Wally says, "Look at me. Is this the face of a 'Pookie' or what?"